For Sunday, my aim was to only move forward, having fallen back after a silly mistake in the first race in a great battle with the top 10. Starting P16, up one already after Steve Foden received a penalty, I felt good. Having stayed with the top 10 on Saturday, I knew I had it in me to get back up there… leaving out silly mistakes, this time. I aimed to make a better start than Saturday and make it to the inside of the oval and crucially, the first hairpin. My start was better, and I managed to get to the inside. For the hairpin, I ended up in the middle of a sandwich on the inside. I held my own and made it round. After battling with two other drivers, I made it away, and had Callum Greatrex in front of me. I was closing the gap. I noticed how he was slow through Gracelands, compromising him into the Tarzan hairpin. On one lap, I got a good run through Kirby and Gracelands and was right behind Callum. He drifted wide and I managed to get on the outside for Tarzan. My plan was to do a cut back. I stayed to the outside and waited for Callum to commit to the corner. I then came across behind him, got a better exit and came past coming out of Tarzan. Very happy with this move, I could now push on. In front there was a slight gap to Adam Craig. I again closed the gap, however when I got to Adam, he defended well and I couldn’t get past. I also didn’t want to make a risky move, as I was happy with how’d I’d done. I ended up in 14th. 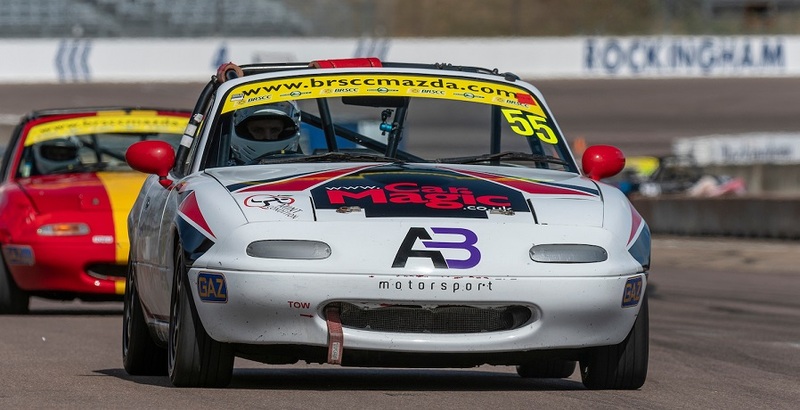 I was happy with this and knew I could do even more in the final race of the BRSCC Rockingham weekend. For Race 3, I started 14th. My plan was to go out and simply do the same. My start was good. I moved to the outside and tried to get round the driver in front. This put me on the outside for the dreaded first hairpin – Deene. Coming into it on the outside, I lost a few places… that’s just the nature of that corner. I made slight contact with Rafal after not seeing him further on the outside than me. However, I knew I had to make up the ground I’d lost. I had to get past drivers I’d already dispatched in the second race. I did this with a couple of moves down the inside of Kirby Corner. I placed my car on the inside, behind them, in the braking zone. This seemed to throw both Callum Greatrex and Martin Tolley on separate occasions. I’d also made my way past Adam Craig and another driver. I ended the race in 12th – my best performance so far in the A race. I was happy at the end of the race, as I’d made up the ground I’d lost and more, and it was a lot of fun! After the race finished and we started packing up for the weekend, it dawned on me that this was my first and last race weekend at Rockingham Motor Speedway, as the track is closing down at the end of the season. As a driver you never want to see a track go down like this, especially when you know you perform well there. It’s a great shame to lose Rockingham, but I know I made the most of it while it was there. Previous Post: SATURDAY AT ROCKINGHAM… ON THE FOURTH ROW OF THE GRID!